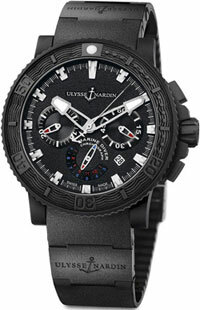 New from the Black Sea Chronograph Ulysse Nardin.All brand Ulysse Nardin introduced a new "ally" for adventurers. All brand Ulysse Nardin introduced a new “ally” for adventurers. He is so bold, bold and venturesome, that stands up to the raging waves – a new Chronograph Black Sea Chronograph. The company Ulysse Nardin has presented is not a simple measuring time, and an exceptional example of “thinking” machines. A massive new sports building in diameter 45.8 mm made of stainless steel and coated with a layer of vulcanized rubber. Such a coating provides maximum leakage, preventing external influence of the environment. The body is equipped on both sides anti-reflection sapphire crystal. The crown on the body is in position 3 o’clock, chronograph buttons surrounded by covered for the convenience of using a layer of vulcanized rubber. Unidirectional rotating bezel marked diver markings and is equipped with an indicator of the scale of the dive. The case is waterproof to 200 meters. Black dial model, made in a concise and rigorous design, graded hour markers and central hour and minute arrow-coated fluorescent substance. Small seconds hand put to the side of the dial in the 3:00 position. The timing functions are displayed on a 30-minute display at 9:00 position, 12-hour indicator at 6 o’clock position, and through the central seconds hand. Date incorporated into the aperture in the 4:00 position. manufacturing of automatic mechanism UN-35, sophisticated chronograph function. Cruising the caliber is 42 hours. The watch comes in rubber strap decorated with two ceramic inserts and fitted with a folding clasp. All the love in the sea just a good idea to buy a romantic Black Sea Chronograph watch and smell the raging sea on the wrist.